I work a few blocks from Brooklyn Bridge Park. At lunchtime or af‎ter work a couple of days a week, some co-worker friends and I go running through the park and over the Brooklyn Bridge. The views from these locations make them ideal picture spots for people in general, but particularly for couples taking wedding photos. One day, we thought we'd ask a couple if they'd mind if we took a picture with them. They actually got a big kick out of it, as did we, and a new hobby was born. We post the photos on Facebook with a description of the couple, where they're from (in addition to locals, we've taken photos with couples from Australia, China, etc. ), and our best wishes for a happy and healthy life together. Our friends get a big kick out of the posts. We've thought about setting ‎up a central site where they could be viewed by anyone, including the wedding couple, but have not acted upon that yet. Often, the couples have their photographers take pictures of us with them, so many already have their own professional photos with the Wedding Hashers (our name for ourselves). Sometimes I'll wander off to other places with the shirts as well. 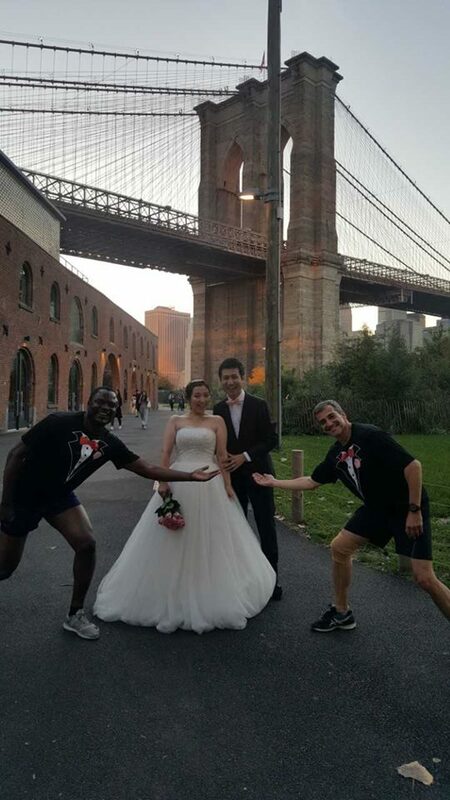 I went to Arizona recently for my cousin's son's wedding and have a shot with him, his bride and his mom, and I've got a couple of great shots when my running club and I ran into couples in Central Park and Rockefeller Center (we even caught a wedding proposal).